Learn Guitar – Beginners Guitar Chord Revealed – How to Play the D Major Chord! With so many chords to choose from it can sometimes feel overwhelming to know where to begin in playing your guitar chords. The D major chord is a great chord to begin learning your basic guitar chords. You will find the D major chord used in many different chord changes found in guitar songs. If you are just starting out in learning how to play your six string instrument, for right now it’s okay to not worry about knowing what all the notes that you are playing. In time, you will want to learn how the D major chord functions in guitar theory. The D chord is actually a very important chord to understand how chords function in music theory. You will want to remember when playing your guitar chords to place your left hand fingers as close to the guitar frets without actually going on top of the frets. This will help give you a crisp and clear guitar chord. Let’s take a look at a step-by-step approach to playing the D major chord. The first note you will be playing is the easiest note because you will not even be placing any fingers on this note. With your guitar pick, pluck the open fourth string called D. You have now played the first note of the D major chord. 2. Next, take your first left hand finger and place it on the third string, second fret. 3. Take your left finger and place it on the second string, third fret. 4. Now, remembering to keep your fingers in position, place your left second finger on the first string, second fret of your guitar. 5. With your right hand holding your guitar pick, starting on the fourth string, strum your guitar pick downwards. If your fingers are positioned correctly you will have now produced the D.
major chord. Congratulations, you’re on your way to learning beginner guitar chords. 6. You will now need to practice strumming the D. major chord. This can be tricky when first starting out due to having to avoid playing string six and five. One solution is to place your left thumb over the six string and mute this open string. 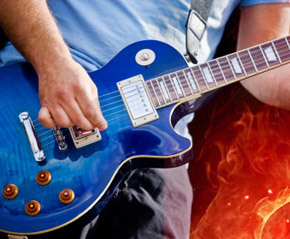 As far as the open fifth note goes, if you accidentally hit it while strumming, it actually won’t sound that bad until you get used to playing only the fourth, third, second, and first strings of your guitar. Interested in learning to play the guitar? 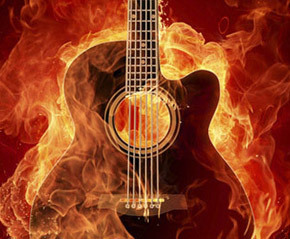 Click here for: FREE GUITAR VIDEO LESSONS!